I’ve been busy over the last year! We decided that the time was right for Brunel University to develop a new degree in Environmental Sciences and I put myself forward to lead it – I’d refreshed a few of our MSc degrees recently so thought the time was right to take on a bigger challenge. And it was hard work… but a lot of fun too. The team that developed the degree took a fresh look at how to structure an undergraduate programme and we came up with the idea of a story that develops throughout the 3 years. In the first year we’ll work on a theme of “Dynamics of Natural Environments”. The students, who could come from a wide range of backgrounds, will spend this year learning about the interdisciplinary principles and processes that govern the environment. This will include the physical, chemical and biological knowledge required to develop a holistic Earth system perspective. In the second year the degree moves on to focus on “Environmental Change and the Anthropocene”. Here, students will examine how Earth systems have changed over time, with a particular focus on human influences. This includes a lot on the “grand challenges” of environmental science such as climate change, pollution, biodiversity loss, land-use change and sustainability. We’ll also look at the effect of these changes on environmental and human health will be investigated. There’ll also be all the other things you’d expect – UK and overseas field trips, work placements, lab work, computing sessions, embedded professional development, problem based learning, optional modules – but I really like this idea of developing a narrative through the degree. I’ll write more about these other aspects as we finalise them and when we run them for the first time over the coming years. Similar to MAD, where every state feels they need nuclear weapons simply because every other state does, perhaps every university needs a MOOC simply because their competitors do. So the question “How do we make money from MOOCs?” becomes moot. The MOOC (nuke) is of no real use to the university (state) but not having it is a disadvantage. 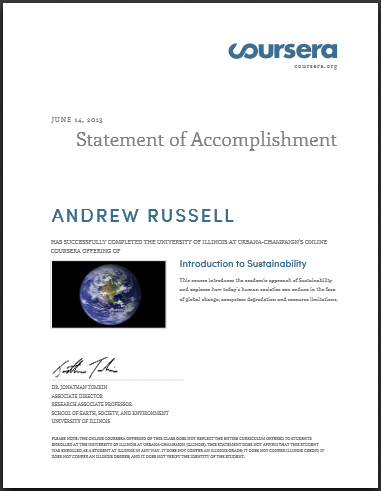 I’ve recently finished a Coursera Massive Online Open Course, or MOOC, called Introduction to Sustainability, which was run by the University of Illinois. Anyway, I’m very proud of myself for getting through the course as it involved quite a bit of work over an 8 week period when I was, amongst other things, delivering two MSc modules as a lecturer, going to China for 10 days and doing all the usual lecturer-type research and admin things. Phew! I then foolishly started another 2 MOOCs as a student, including Climate Literacy. One of these I completed and the other I dropped out of (that was Climate Literacy – it was good but I had too much other stuff on to be able to complete it). So the point of this post is to share some thoughts on the course, provide some signposts to other interesting looking climate related MOOCs that I might have a go at and perhaps think about how MOOCs might fit into the future of Higher Education. One of the key issues with MOOCs is how to make money from them and there’s a list of “Eight Possible Coursera Monetization Strategies” that I’ve seen in a few places. These seem to be direct monetisation techniques where I would have thought that the most obvious route would be via increasing awareness of your university’s courses and increasing recruitment that way. Indeed, the first message I received from the Sustainability MOOC organiser following completion was an invitation to another course that had a fee. Still on the money theme, I almost stumped up the $39 for the “Signature Track” which is offered with the Climate Literacy MOOC – this requires you to jump through some hoops every time you do an assessment to prove that it’s you taking the tests. I’m not quite sure of the advantage of this. I suppose the current “Statements of Accomplishment” would be pretty easy to copy if you really wanted to – see mine to the right – and if the Signature Track gives you something that can be more rigorously linked to your profile then that would be nice. But then this could be solved by making user profiles public with grades of the MOOCs you’ve completed, which I don’t think they do right now. Either way, I’m glad I kept my $39 as I didn’t finish that particular course anyway! Who is the current Secretary General of the UN? The next level of question would be where there isn’t one indisputably “right” answer but where the question requires some thinking and is open to some interpretation. This requires even more thinking on the part of a student (and instructor) as an answer that the instructor deems as wrong could be right in certain circumstances (or vice versa). There then becomes an element of second guessing the instructor to put answer that you think they would say was “right” rather than the answer you think/know to be “more right”. I hope that this isn’t to confusing a point or taken as a specific criticism of the Sustainability MOOC; it is a general point that setting good MCQs is very hard (and fundamental to the success of the MOOC structure). Maybe I hadn’t appreciated how big these beasts are: following Week 1 of Climate Literacy I had a quick count and there were over 4,000 posts in the Discussion Forums. That is big. As well as MCQs, a lot of MOOCs use peer review to mark work (e.g. you write a short essay and another student on the MOOC marks it). They tend to take an average of a group of peers but you’re still a little at the mercy of the random selection of peers. And with such large groups it must be very hard for moderators to deal with abusive/bad peer reviewers – there could be 10,000s of peer reviewer comments in the early weeks of a MOOC. …I’m quite impressed by how much the MOOCs made me think and learn and I’ll be keeping an eye on how they develop. I’d certainly be happy to see applicants to our MSc courses taking MOOCs in preparation and as evidence that they are motivated to study. How will the increase in undergraduate fees affect taught postgraduate fees? Undergraduate tuition fees in England are set to rise in 2012 with most universities aiming to charge the maximum possible £9000. This is a topic that many people are thinking about, particularly how it might affect the future of the higher education sector. What I haven’t heard many people talk about, though, is how the fee rise might affect the fees for taught postgraduate courses, such as an MSc or MA. In my field, the fees seem to be around £4000-6000 for a 1-year, full-time postgraduate course. I don’t really know how these fees are calculated. In science and engineering, it has become very common to take a 4-year undergraduate degree, often called something like MSci, MPhys, MChem or MEng. After 2012, though, the fees for all years of courses like these will be over £6000, most likely £9000. I’m guessing that more people will be happy with a 3-year BSc than pay another £9000 to get an MSci, MPhys, MChem, MEng etc instead of the BSc. Alternatively, they might choose to graduate with a BSc and then enrol on an MSc course and (assuming MSc fees don’t increase substantially in the next few years) they could get two degrees (BSc and MSc) for less than the price of one (MSci). Of course the assumption that MSc fees don’t increase substantially in the next few years was meant to be the focus of this post. So what might happen? Will universities that run 4-year undergraduate courses increase their MSc fees to protect their undergraduate income? Maybe some universities could use lower MSc fees to “poach” students from other universities or other courses within their university. Or, perhaps most likely, taught postgraduate fees will increase to come in to line with undergraduate fees. I’d expect that this would decrease the number of students staying at university for a 4th year in any form, which might even affect the numbers that go on to PhD level and beyond. I don’t really know. I’d like to hear what others think though.